My system drive had been acting slow lately and way too audible for my taste. And it takes some real effort to make sounds from inside of multi-layered sound dampening enclosure. So I decided it is time to give SSD a try. Kingston is aggressively targeting consumer market with their Value lineup so it was natural choice. I considered simple model from V lineup but after reading up on it V+ lineup performance seemed worth higher price tag. So earlier this week I got and installed solid state drive SNV225-S2 model in 64GB capacity. Kingston offers upgrade bundles for desktops and notebooks, but for this model there was only basic package with drive itself available. Disk is quite boring brick of metal (no electronics visible like it is common to hard drives). It is identical in size and SATA connectors to 2.5” hard drive but weights less (84 against ~120g for hard drives). For notebooks it is easy drop in replacement. For desktops it is more tricky, because very few cases have mounting slots for 2.5” drives. There are brackets to mount 2.5” drives in 3.5” slots for that, but nothing I could buy right away. Just left it at the bottom of case for now. I didn’t want to mess with operating system so I cloned my current drive from LiveCD. SSD didn’t want to boot right away, so I also had to run fixmbr from Windows Recovery Console. Drive supports (more like emulates) SMART, with few error-related parameters reported. I had disabled MyDefrag screensaver. Defragmentation is not beneficial and even potentially harmful to SSD. Performance loss from fragmentation is minimal, because there is no mechanics involved and seek times are much shorter than for HDDs. I also had moved Windows swap file from second physical drive to system drive. It makes sense to keep it on separate drive for hard drives, but for SSD performance gain from SSD itself is larger than from compartmentalizing. Since I went down a partition I also had to adjust startup entries with Autoruns, re-link Dropbox and re-configure Ketarin and HFS. Other than that most of my software is portable and survived move just fine. no noise of any kind, hard drive noise is extremely hard to eliminate and silent operation is huge advantage of SSDs. This type of practical benchmark isn’t too precise and speeds aren’t anywhere near theoretical limits. Still even if not pushed to the max, SSD shows massive improvement in both read and write speeds. By now SSD had solved battery of early performance and data loss issues. But they are still cutting edge tech and lineups are changed very rapidly. 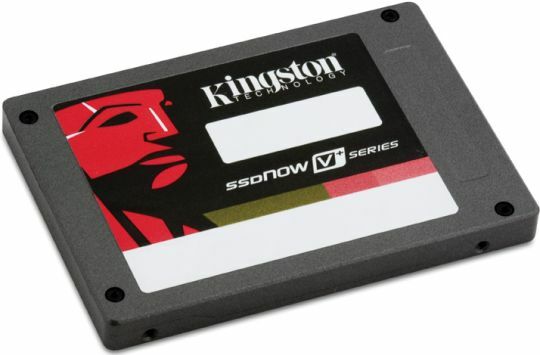 SNV225 is not even half year old, but Kingston already lists newer SNV325 models in V+ series. The one specific issue that gets most of attention is TRIM command, that is only supported in very latest SSD and natively only in Windows 7. SNV225 is one generation to early to support it and so it has potential performance issues in long term when drive gets some usage. I guess I will have to see for myself in following months. Still not mainstream, but is excellent performance booster for a price well in range of power user toys. Very pleased with it and will see how it fares in long term. The 128-gig model is $500 …way out of my price range, and way too expensive for 128-gigs ! future of PC storage ! But a 64-gig drive is too small, and the 128-gig drive too expensive. When the 128-gig model sells for the current price of a 64-gig model, I’ll definitely buy one. Nice thing about computer parts: You can always count on future versions being both ~better~ and ~cheaper~ ! You mean you need 128GB overall or that much for system disk alone? For me 64Gb is perfectly fine for system drive. If I really had to I might have even fit everything I need on it (it’s entertainment that eats space, not serious stuff). By the way I also bought new media drive with SSD – 2.5″ 500GB hard drive (model listed in table in post). May be more expensive per GB than 3.5″ drives but much more compact and quiet. Now I only need fitting case to buy mini-itx motherboard and pack my desktop in tight small form factor. system files. Pretty soon 64-gigs gets filled up. as a system drive, 64-gigs is barely adequate. I am not infected with thirst for gigabytes. :) My current storage is only these 64GB SSD + 500GB HDD. Heh, I have about 1TB worth of drives just lying around unconnected. Yes, it’s more easy than ever to get multy-terabyte storage in desktop PC. But why bother if I don’t need that much. Currently I have 40GB used on SSD – that is WindowsXP, all of my software (portable and setup packages) and ~15GBs of recent anime and such.